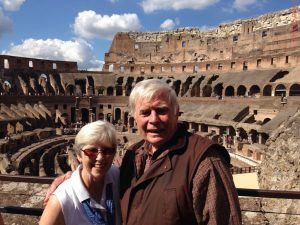 If CNN, MSNBC and FOX News were covering the entertainments in the Roman Coliseum in the First Century they would have been exhorting the lions. Of course, the reason for this is the ratings would suffer if they sided with the humans. The public demands spectacle, not fairness. Or as Mark Twain opined: “One of the most striking differences between a cat and a lie is that a cat has only nine lives”. Pudd’nhead Wilson, Chapter VII. In William Shakespeare’s Othello, Act 3, scene 3, Iago complains: “Who steals my purse steals trash …[But] who filches from me my good name robs me of that which (does not) enrich him [but] makes me poor indeed”. Our current spectacle steals from both accused and accuser equally. When it comes time to clear the floor of the Congressional Coliseum no one will remain unscathed and we will all be poorer. Rome today is a decaying tourist amusement. The days of roads, aqueducts, legal systems and Pax Romana declined with the declining investment of the citizenry in self-government. Today we would have to include the national media in this equation. It is not that we do not know how to reasonably go about choosing our leaders such as presidents, legislators and supreme court justices, it is that it is a lot more fun to watch others being ripped apart than to engage in rational debate. Bring on the lions, we are bored with this democracy thing! My mother’s three brothers and one of her three sisters served in the army in WWII. Uncle Buck flew close order air support of ground combat soldiers, one of whom could have been Uncle Bill. Uncle Bud never saw a shot fired in anger but went where he was told. Aunt Betty was an army nurse. My two brothers and I served in the military during the Viet Nam War as did my sister Jane’s husband, Bruce. Bruce was stationed in North Carolina and was not sent to Viet Nam. My eldest brother, C.E., is a fine musician and the army decided it needed his saxophone for the U.S. Army Field Band more than they needed his rifle. My other brother, Phil, is an excellent attorney whom the army ordered into the Judge Advocate Corps as they thought his legal advice was more important to the war effort than his fighting. And for reasons known only to the U.S. Air Force my country determined my supposed linguistic skills were more vital for gathering Intelligence than was my body for cannon fodder. One of my numerous first cousins, Billy Mike, survived a year in combat in Viet Nam and my son, Jim, earned a Combat Infantryman’s Badge in the Gulf War of 1990-91 and another in the Iraq War in 2006. He also earned a Bronze Medal for service in each war. My son, my cousin and two of my uncles dodged enemy fire while my other uncle, my aunt, my brother-in-law, my brothers and I simply went where we were sent. Twenty-nine of our presidents served in the military before becoming Commander-in-Chief. Some saw combat, some did not. At least two of our recent presidents actively avoided serving themselves but later, as President, sent others into combat. Abraham Lincoln always dreamed of military action and regretted only serving about one month of non-combat service during the Black Hawk War (May 1832–August 1832). Ironically, he later served as our top non-combat “soldier” during our deadliest war. These differing military/non-military, combat/non-combat circumstances were brought sharply into focus for me last week when some of my siblings (C.E. 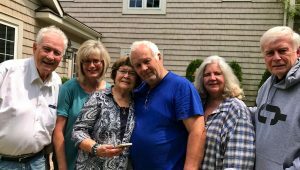 and his wife Shirley plus my sister Jane along with my wife Peg) and some of my first cousins (Susie, Barbara Joan, Billy Mike and his wife Annette along with their son Ryan) got together in Canada for our first full blown reunion since the Viet Nam War. The hair may now have a lighter hue but absolutely nothing important inside has changed since we threw firecrackers and climbed on the huge sandstone rocks at Osage Hills State Park in Osage County, Oklahoma over half a century ago. We each almost instantly realized what a debt we owed to our parents and grandparents for all the times they brought us together at Christmas, the Fourth of July, Labor Day, Thanksgiving, weddings and funerals. The bonds formed in an enchanted childhood not only helped us through these many intervening years although separated by time and space, we found they remain unbreakable even today. And the strongest bonds were formed by loving relatives who supported those who were strong enough and wise enough to address with action the futility of wars fought for reasons other than national defense or humanitarian necessity. So, thank you to our ancestors who taught us the value of loving one’s country and one’s family and to those who are keeping the flame burning brightly in spite of time and distance. As President Trump and Secretary of State Pompeo negotiate with North Korean leader Kim Jong Un and his lead negotiator Kim Yong Chol over a possible summit, the 5.7 million Americans who served during the Korean War (1950-1953) continue to pass away. We have already lost about two thirds of them and on May 23, 2018 we lost another, Harold Lee Cox. The mission for which Americans fought and died was accomplished. If you said The Gulf War of 1990-1991, that is understandable. Almost all Americans supported that war and recognized that victory. However, I am talking about the Korean War of 1950-1953. It too was a great victory for American and United Nations interests and helped prevent World War III. We owe a huge debt to our Korean War veterans. Two of those heroes (they just hate to be called that but, hey, it’s my column and facts are facts) are Posey County natives and brothers-in-law Harold Cox and Gene McCoy. Harold fought with the U.S. Army’s 25th Division which suffered many casualties and bore much of the fighting in Korea. Harold was an infantry rifleman and was the jeep driver for his company commander. Gene was a combat engineer with the Army’s 84th Engineers Battalion and, also, served as a courier/mail deliverer. Harold was on the frontlines and Gene was building wooden bridges about 1000 yards behind those lines. Gene says Harold had it a lot rougher than Gene. Harold said one of his worst memories, outside of dodging enemy mortar rounds for a solid year of combat, was the stench of the human waste the impoverished Koreans would save all winter and fertilize their rice paddies with in the spring. Gene, also, mentioned that nauseating smell and the mud and flooding caused by the lack of vegetation due to constant shelling. When Gene first arrived in Korea they put his outfit on a train which stopped frequently. Each time it stopped the young soldiers were given a few rounds of ammunition and ordered out to guard the train from sabotage. Gene said this initiation to Korea was more than a little unsettling. Harold and Gene came home and re-started their lives. Harold served as Mt. Vernon’s Water Superintendent for several years in the 1980’s and 1990’s. Gene served as a Mt. Vernon City Councilman and the Posey County Recorder. Gene is currently Posey County’s Veterans Affairs Officer. They both raised families and went on publicly as if there had been no Korean War. However, privately what General Douglas MacArthur called “the strange, mournful mutter of the battlefield” never left their consciousness. Of course, there was a Korean War and it helped save you and me from another world war. It was a largely unappreciated “mission accomplished.” Thank you Harold and Gene and all your fellow Korean War veterans. It is only human to question the value of any military endeavor. But when one considers that our Korean War veterans of sixty-five years ago encouraged today’s world leaders to sit at a negotiating table rather than send more soldiers into new battles we owe our veterans the honor of saying thank you as we say goodbye. My Mom’s three brothers and one of her three sisters served in the Army during World War II (1941-1945). Aunt Betty was a nurse, Uncle Bud, who was a rodeo cowboy, was in the cavalry, Uncle Buck flew close air troop support over Europe and Uncle Bill killed and saw killed way too many men from Anzio to Germany. Mom sent any extra we had, and some not so extra, to support her siblings and their comrades. My Mom’s Mom’s Mom’s father, my great-great grandfather immigrated with his parents from Bern, Switzerland in 1852 when he was fourteen. His father served as a career soldier in Switzerland for 21 years. They settled in LaGrange, Indiana. My great-great grandfather, John Giggy, enlisted in Company H, Forty-Fourth Indiana Volunteer Infantry on August 28, 1861. His first major battle was Fort Donalson then he was wounded at Shiloh and sent to the military hospital in Evansville to recover. He continued fighting and marching, marching and fighting until mustered out at Indianapolis in October 1865. He became a farmer and a stone mason and fathered 9 children including my great grandmother, Agnes (Giggy) Vulgamore. Thereafter he simply went about his life without thinking his country owed him anything more than a fair opportunity to raise his family and be left alone. I never had the chance to meet him but I am confident his toughness helped buy me and my siblings a better life. Thanks to Grandpa, Aunt Betty, my uncles and all the other tough and non-assuming veterans who did their duty so the rest of us could do things they could not have dreamed of.